The United States deliberately did not declare war in Vietnam, in fear of drawing either China or the Soviet Union into the conflict. This however, led to a “credibility gap” within the United States, as the Administration failed to explain the costs and benefits of the war to the American people. Operation Rolling Thunder, for example, carried out between 1965 and 1968, dropped one million tons of bombs on North Vietnam, 800 tons each day during the three-and-a-half year period. Each time a B-52 was sent over North Vietnam on a bombing run, it cost $30,000. The cost of just the air war had spiraled to $1.7 billion by 1966. Troops commitments also escalated under the Johnson Administration, to a peak of 536,000 U.S. soldiers stationed in Vietnam by 1968. It seemed that the more troops that were sent to Vietnam, the more the American public (especially the young) turned against the war. The United States measured its “victory” in body counts. 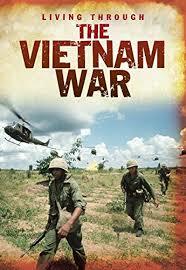 It would be a war of attrition as more and more North Vietnamese soldiers and Viet Cong guerrillas were killed. In the United States, deeper troop commitments on the part of the Johnson Administration meant wider and wider use of the draft. However, college deferments kept many upper and middle class young men out of Vietnam, while the poor and working classes formed up to 80 percent of the fighting force. Draftees were assigned to one year tours; their motive was “stay alive for 365” and go back home in one piece. Agent Orange – During the Vietnam War the United States military dumped millions of gallons of herbicides and defoliants on the Vietnam, Laos and Cambodian countryside. Agent Orange Disease – The disease may present no symptoms until many years after exposure to Agent Orange. Agent Orange Exposure – Agent Orange exposure has been linked to a multitude of health effects ranging from skin damage to numerous cancers and severe birth defects. Agent Orange Veterans – Since being exposed to Agent Orange while fighting in the jungles of Vietnam, American military veterans have not been silent about the health problems related to their exposure. Bombing of Hiroshima- Bombing of Hiroshima term paper examines the year of 1945 and the bombing that took place in Hiroshima. Effects of Agent Orange – Used extensively during the Vietnam War, Agent Orange was a deforestation element that was designed to remove the extensive jungle cover that the enemy used to hide their operations. Ho Chi Minh Trail – During the war, northern Vietnam’s 12 divisions were all touched by the famous trail. Operation Rolling Thunder – Operation Rolling Thunder was a sustained airstrike against North Vietnam by the US Navy, US Air Force, and the Republic of Vietnam Air Force during the Vietnam War. Paris Peace Accord – Inspection of the terms of the Paris Peace Accords reveal that the United States basically had to end the Vietnam conflict by completely removing any hint of a military presence. Vietnamization – Throughout the Vietnam War, various American Presidents enacted a number of foreign policy principles designed to bring our military success in the conflict. Paper Masters writes custom research papers on Vietnam War and looks at the war and how it progressed after the Geneva Accords.